You need a strategy for the long, complex and resource-intensive road from idea to commercialization of a cell therapy. You need a plan to deliver the right quality, cost of goods, and sustainability. 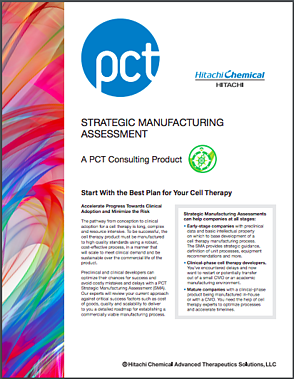 No matter what your phase of development or level of experience with cell therapies, PCT can deliver the plan you need with a Strategic Manufacturing Assessment (SMA). At its core, the SMA is an independent, disciplined, and diagnostic evaluation of a cell therapy process that can be completed in six to eight weeks. For more information on an SMA from PCT, download the SMA brochure and reach out to the PCT team to learn more. Learn more about our additional consulting services, including manufacturing development, regulatory services, and business development and commercialization support.